LOUISVILLE, Ky., (WDRB) -- Six times during an armed robbery trial last December, defense attorney Frank Jewell asked Louisville Metro Police Det. Derrick Leachman whether he took photos at the crime scene. Six times, Leachman testified under oath that he had not. But after Jewell's seventh attempt, Leachman finally acknowledged he had taken crime scene photos but "the pictures were lost and I didn't want to testify that I lost pictures," according to a video of the trial. A jury later acquitted the defendant and Leachman's testimony and actions were criticized by the prosecutor and the police department. In July, he was suspended 30 days for losing evidence and providing "misleading testimony" during the trial. Now, as part of a new police policy, Leachman and more than two dozen officers whose conduct could be problematic in future cases have had their names and disciplinary issues turned over to prosecutors - and possibly to defense attorneys at some point. Also as part of the policy, Police Chief Steve Conrad has put the department's 1,181 officers on notice that any violations involving untruthfulness "will likely lead to termination from this department." In an interview, Conrad said he is taking a harder line on untruthfulness than his predecessors, in part, given the recent change in policy, and acknowledged he would have likely fired Leachman had this policy been in place this summer. "We now have a number of officers who when they testify have to explain that situation in the past," he said of officers being untruthful. "I just don't want to have to deal with this again. Our credibility is important. It affects the community's trust in us." As of Nov. 25, the department implemented a policy to provide prosecutors with a continually updated list of officers who are under investigation or been disciplined for something that could cause their credibility to be questioned at trial and could be considered exculpatory evidence for the defense. 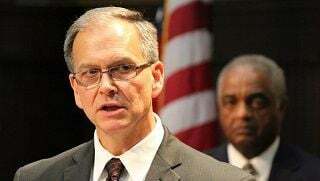 Police spent more than six months developing the policy, consulting with other police departments across the country as well as the local county attorney, commonwealth's attorney and U.S. Attorney offices. "We have an obligation to turn that information over to the prosecutor handling that case," Conrad said, acknowledging that no specific policy was in place when Commonwealth's Attorney Tom Wine asked for a copy earlier this year. The Commonwealth's Attorney's Office also didn't have such a policy, said Wine, who took office last January. "We saw a problem and we worked to rectify that," Wine said in an interview. With the policy in place, prosecutors recently notified defense attorney Sheila Seadler, who is handling a robbery case Leachman is involved in. There are no allegations of misconduct by the officer in that case. "We used to have to search for this information ourselves and no court would hold prosecutors accountable for not turning it over," said Seadler. "I think it's helpful for the integrity of the system. It's something that should have been brought up before this." Last week, Conrad sent out an internal memorandum notifying officers that it will be tracking this information for prosecutors and putting them on notice that violations involving truthfulness or bias would likely lead to termination. "This is my effort to tell everybody I'm going to be harder," Conrad said. "I don't want that list to grow." Among the misconduct the department is now tracking: a sustained finding or credible allegation of untruthfulness or bias, any criminal charges brought against an officer and any evidence that points toward a defendant's innocence. Thus far, there are 26 officers on the list, including two with open investigations against them and three who have left the department but may still have to testify in pending cases. Among the officers on the list are several who have been charged with, and in some cases, convicted of a crime. They include Officer Joe Burden, who was charged with two counts of official misconduct for allegedly detaining a woman while on duty and telling her to pull down her pants and expose herself during a routine call. That case is pending. Some officers included in the list were charged with crimes but eventually found not guilty. And several other officers were not criminally charged, but were disciplined internally, like Leachman. Officer Kevin Taulbee, for example, was found to have given false testimony during a suppression hearing on Oct. 21, 2010, according to his disciplinary file and the list turned over to prosecutors, which WDRB obtained under an open records request. In July 2012, Conrad suspended Taulbee for 30 days, telling the officer in his disciplinary letter that he was not being fired because he had no other major disciplinary history, had a good work ethic and was truthful during an internal and criminal investigation. The new policy requires police to notify each prosecutor's office; from there, prosecutors would decide whether the evidence requires them to notify the defense. Wine said case law requires prosecutors to disclose exculpatory information in a timely manner "prior to trial" so it can be used at trial, but not as soon as they hear there may be an internal investigation. But Dan Goyette, head of the Louisville public defender's office, said prosecutors have an ethical duty to disclose information about the officer in a case "when it becomes known to them." "…Any suggestion that there is no time limit for disclosure as long as it is produced prior to trial is incorrect," he said. And Goyette pointed out that Wine's stance is "ironic" given Wine recently asked the state Supreme Court to amend criminal rules to require motions to suppress prior evidence be made at least 20 days prior to trial. Wine said last month that he wanted the high court to change the criminal rule, in part, so prosecutors won't "be caught by surprise" during trial. Wine responded to Goyette's claim by saying his office wasn't "playing hide the ball" and would provide the evidence in a timely manner -- but that there are no legal requirements for turning over evidence immediately after prosecutors are notified. "We're not going to be held to a rule that doesn't exist," he said. Goyett disagreed, saying prosecutors have an ethical duty under the Kentucky Rules of Professional Conduct to timely disclose such information - "and that means when it becomes known to them." Regardless, Wine said his office has already begun to alert defense attorneys about some officers whose credibility will be called into question. Conrad said the police department has always had an obligation to turn over evidence that could be considered advantageous to the defense. But potentially exculpatory information about officers hasn't often been turned over to defense attorneys under previous administrations. Conrad said now the process is formalized and "everyone in the department is on notice of what information we are going to share." The policy, he said, "makes it very clear to our employees and to the prosecutors and to the defense bar and quite frankly to our citizens that it's important to us that we share this information and head into any criminal procedure with a level playing field." Many police agencies have implemented similar policies, resulting in some officers being reassigned to non-patrol jobs because their credibility could become an issue at trial, said Tom Barker, a professor in the School of Justice Studies at Eastern Kentucky University. "The key to police officers is their truthfulness and ability to testify in court," Barker said. "It is a stigma that will follow them the rest of their career. I think it's a good move for (Louisville). It will improve integrity and provide consequences of being untruthful in any way." Asked about the consequences for police on the list, Conrad said "it's something that officer is going to have to live with." Conrad said each time the officer has to testify in court, "they are going to have to answer questions about the previous incident that lead to that sustained finding of untruthfulness or bias or a criminal charge and they are going to have to explain that and it will be the prosecutor's job to try to rehabilitate their witness to the point they can testify in court." However, defense attorneys may not even be able to mention the officer's past – especially if there are other officers involved in the case and the prosecution can work around the problematic officer. One judge has already ruled that a defense attorney could not bring up an officer's lengthy disciplinary record, which included several instances of dishonesty. In 2011, Jefferson Circuit Court Judge Barry Willett ruled that a defense attorney could not mention Officer Charles Moore's lengthy disciplinary record – including several instances of dishonesty - in an effort to impeach his testimony in a drug trial. The defense attorney, Chastity Beyl, wanted to have Moore testify about his more than 800-page internal police file, which includes being suspended from the force seven times, reprimanded on another eight occasions and being the subject of four criminal investigations. But Willett ruled that since prosecutors had chose not to call Moore as a witness, instead relying on the testimony of another officer involved with the case, it would not be appropriate to allow the defense to question Moore about his disciplinary record. The new policy could affect how prosecutors approach criminal trials. For instance, Wine said his office may look for other officers involved with a case to testify. But if that officer is the only one involved in the case, Wine said they could still put the officer on and let jurors decide on whether he is credible or not. "It's not the end of the case," Wine said. "Does it make your case more difficult? Perhaps. But it depends on all the other evidence in your case." While some officers on the list, like Moore, have been given roles inside the department that lead them to make very few arrests, others have dozens of pending criminal cases. Officer Chris Thurman, for example, has more than 100 pending cases, including several involving arrests for drunk driving and at least three murder or manslaughter cases in which he is the lead officer. Thurman is on administrative duty for allegedly falsifying his time sheet, claiming overtime he may not have worked, according to court records. Many of Thurman's cases have been postponed pending the investigation, but the County Attorney's office has said it may lose some of them. For an officer like Leachman, who was untruthful during testimony, experts say prosecutors will be hard-pressed to rehabilitate him in the eyes of jurors. Leachman, who wasn't charged with perjury because he corrected himself shortly after lying on the stand, did not return a request for comment left through the department. Wine, the commonwealth's attorney, acknowledged that the credibility of witnesses - police officers or others - can be damaged if they're found to have been untruthful on the stand. "That's a stigma that's going to be with that individual, whether it's a lawyer, lay person or anyone else," he said. "It's the one unpardonable sin."